The rock legend said that after Obama ran with an optimistic message of change in 2008 he now faces "a world that challenges your hopefulness." Springsteen has accompanied the US president on his final day of campaigning , travelling with him on Air Force One and opening rallies for him in Madison, Wisconsin; Columbus, Ohio; and Des Moines, Iowa. Springsteen's appearance came a day after Stevie Wonder energised a Cincinnati rally for Obama, prompting the president to do a brief shimmy on the stage to Signed, Sealed and Delivered. 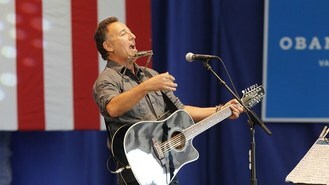 Springsteen joked that while he's proud to be endorsing the president again, "that first debate really freaked me out."